If you have toddlers then you will know that trying to find quality crayons and markers can be tricky. Some crayons are too small and most marker pens last about 30 seconds before they crush them, and that’s if they don’t draw on the walls first. This week we have been testing out some great new Crayola products designed especially for toddlers. I’ve previously reviewed some Crayola products and we really loved them, however their new range is even better for young children. The new My First Crayola range is designed with little hands in mind. 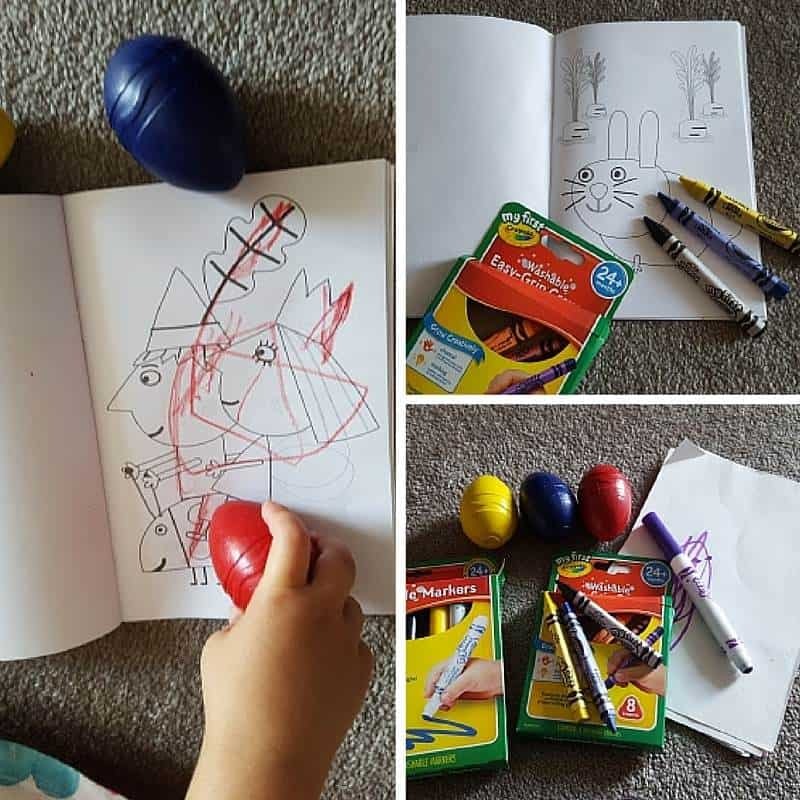 The range includes palm grip crayons, non crush washable markers and easy grip crayons and pencils, along with colouring and activity books designed for toddlers and preschoolers. I’ve mentioned before that the washable markers are definitely worth it. If you have a toddler you will only ever buy non washable markers once. These markers really do wash off easily with a bit of soap and water and will wipe off most items, but the new feature that I love even more is that they are non crush. Finally we can have markers in the house that last more than 30 seconds before they are ruined! My 4 year old is very happy that her younger sister is no longer ruining all of her markers. We have been using these for almost a month now and they are still all working without being crushed. The palm grip crayons are an excellent first crayon. They are shaped like an egg and very easy to grip. Perfect for those first stages of scribbling and drawing. Once they have mastered these they can move onto the smaller easy grip crayons and pencils. We’ve had lots of fun trialing the new My First Crayola range and highly recommend them. If you follow us on Instagram we will be sharing some of our creations this week. 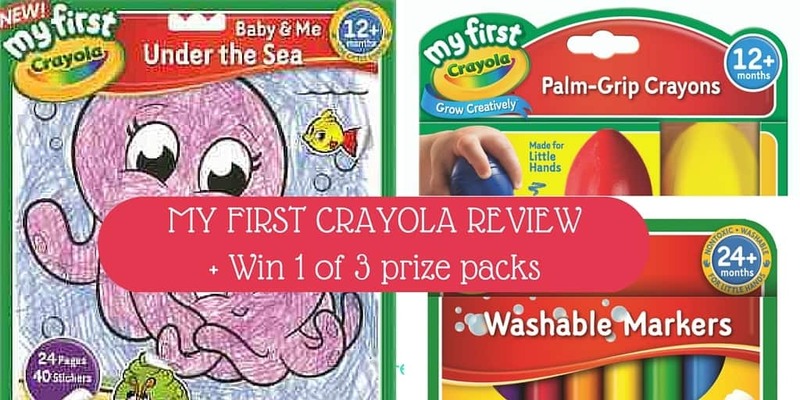 Crayola have kindly offered to give 3 of our Australian readers a lovely My First Crayola prize pack. Filed Under: Toddler Reviews, Win! How awesome are these!! Perfect for my toddler to practice his fine motor and pencil grip! These would be great for my grandson who is just starting to hold things and trying to write. Palm grip crayons would be amazing! This would be awesome for my godson who loves to create with his imagination something colourful and bright. My children grew up with Crayola and now my grandkids love them too, What wonderful pictures adorn my fridge. My kids are very crafty, so I’d love to win this so they’d have more supplies on their craft table, as they do go through a lot! I grew up with Crayola and now my niece does. I would quickly become the favourite Aunt if I won this for her. Creating is the imagination’s internet. It allows them to visit places and meet people that the internet and computers can’t match. It gives peace. I’ve just watched my toddler drawing and she’s either eaten the crayons or snapped them in half! We need the grip crayons! Because my girls love being creative through colour and imagination and only Crayola’s dazzling products can enhance their bright minds. Nan uses Crayola and so her grand daughter tries to take them. At 18 months I can not let her have mine, so I think it is time I get some for her to show her these are the best and far as I know those stubby ones are unique to Crayola. Made a mistake will redo it. My 18 month old granddaughter is always trying to take my Crayolas, I think it is time to get her ones more suited to her. My toddler would go nuts over this! She got her first colouring book the other day. Which ended with crayon on my walls! I’d love to win this pack for my most imaginative and creative little boy. The washable markers are ideal and I wish I’d known of them sooner. We love our arts and craft time, and this crayola prize pack would be very well loved in our household. Baby gets frustrated when he tries. this pack would end this suffering. To see the accomplishment in his eyes. I have a budding artist who loves experimenting with wonderful artistic products and Crayola is top of our list. Allowing my son to use his imagination and explore. Crayola lets them create, masterpieces they draw! helping them with their skills anything is possible, and more. It will motivate him to imagine things and give him the best opportunity to draw his imagination on paper and colour it as well. My son loves drawing a pic everyday for his dad for when he gets home from work. I’d love him to try these crayons out. My little nephew would love to have his very own Crayola’s. And washable is perfect for me! No accidents to worry about. My son would love this Crayola pack. Perfect for the cooler weather to get creative in doors. You can’t go wrong with quality Crayola products. Watching my daughter be a ‘big girl’ and colour-in like her older sister will put a smile on everyone’s face. My son is getting better with his writing. He’d love to use these! Drawings will be less of a state. My son has been itching to get in to the arty stuff. These would be great to satisfy his creative urges. My youngest daughter struggles with not breaking ‘big girl’ crayons so this pack would be wonderful for her. Our little Miss four would love this. She loves to colouring in. She says she does it to have peace and quiet! In fact she is allergic to the sun so we are so glad that she has an indoor activity that she loves… and she won a colouring in competition. She was s excited. My two year old daughter is just starting to find her creative side. She loves to scribble and sort through all the different colours of her crayons. Any of my 4 kids would love this! My son loves to ‘draw’ like his big sister but gets very frustrated when he can’t produce pictures like his sister. He would love these! My 3 budding artists would love this prize. The palm grip crayons would be perfect for my 2 year old daughter that is using her brothers band me down crayons.